Construction of a 12 MW wood-fired biomass plant. Weiss France announced last week that it is building a new 12 MW wood-fired biomass plant on behalf of ENGIE in the north-eastern Paris suburb area of Sevran. The new facility will supply to the SEVEO district heating network in Sevran, providing energy for 8500 residential units. Work has already begun on site and industrial commissioning will start at the end of the year. 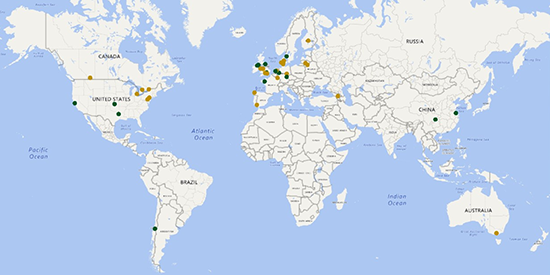 In the week ending 27th October 2017, AcuComm added or updated 39 projects to our database. These have a combined estimated value of US$2,322 million. There were 18 completely new projects this week, and 21 updates. This brings the total number of active projects in the AcuComm database to 4,913. They have an estimated value of US$344.8 million, or US$70 million on average. The Bahamas was the leading country in the past week in terms of project value, accounting for US$400 million. This was equal to 17.2% of the total. The leading feedstock this week was MSW, which accounted for 13 projects and an estimated US$1,269 million. This is equal to 54.6% of the total this week. For the full list of the latest projects, click here. Construction of a waste-to-fuel plant. N+P Group have announced that construction of a new waste-to-fuel plant at the former Impetus Waste Management site in Billingham, Teesside will begin in the next few weeks. The new waste-to-fuel facility will produce Subcoal pellets from residual waste, which will be then sourced to cement kilns and power plants. The new site is expected to produce between 500,000 to 750,000 tonnes of high-quality refuse-derived fuel (RDF) per annum. The plant is scheduled to begin production mid-2018. After announcing its plans to construct a new 49.9 MW biomass plant in El Bierzo, Leó in October 2016, Forestalia announced yesterday (Thursday 26th October) that it has awarded the turnkey contract to Acciona Industrial. The contract also involves the operation and maintenance of the plant for 15 years. The new plant, which will cover a space of 100,000 square meters, will aim to have the lowest emissions and highest efficiency in Europe, complying with the strict new objectives set by the European Commission, which will come into effect by 2020. The feedstock will be solely forestry and agricultural biomass. Work on the plant is scheduled to begin in the first half of 2018 and will continue into 2019. Earlier this month, Chile’s first plant to recycle gas from refrigeration and air conditioning equipment was opened. It will remove moisture, oil, acidity and pollutants from the gas in HCFC and HFC cylinders. Regener, who completed this project, is hoping to implement more facilities in the north, south and central areas of the country. ABP’s renewables division, Olleco, has announced the opening of a new anaerobic digestion facility in Aylesbury. It will convert over 100,000 tonnes of waste each year into heat, power and biomethane, which will be exported to the National Grid. The adjacent Arla dairy facility will work in conjunction with the plant, which will help it to become a zero carbon milk processor. Last month, a new anaerobic digestion (AD) plant was inaugurated in Hourtin, Gironde. The plant features two digesters, a post digester and an incorporation hopper that will process 65,000 tonnes of pig manure and crop waste each year. The energy that is produced at the facility will be sold to EDF. For the full details associated with this project, click here. Next up in our series of Global Waste Investment Fact Files is the Ghana edition. As of August 2017, AcuComm was listing seven waste projects in the country. These have a total value of US$293 million, or US$42 million each. Integrated/mixed facilities is the leading project type, accounting for US$190 million or 65% of the total. This is followed by recycling, accounting for US$49 million or 17% of the total. The total estimated capacity of these projects is 2.9 million tonnes. This is equal to 417,492 tonnes per project on average. This capacity is equal to 72% of Ghana’s estimated annual waste generation at 4.1 million tonnes. Waste investments totalling US$268 million are expected to become operational over the next few years. 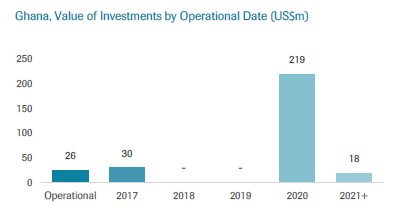 This is currently expected to peak in 2020 at US$219 million. 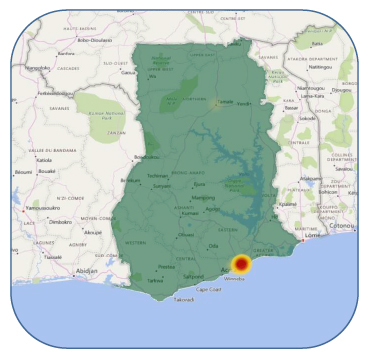 Alternatively, you can explore the projects in Ghana in AcuComm’s database by clicking here. A combined heat and power (CHP) plant located in Helsinki has undergone an upgrading process to convert the facility from a total reliance on coal to a combination of coal and wood pellets. The first wood pellets were ignited at the plant last week and the facility will continue to be trialled in the coming months. Round-the-clock heat production with pellets is expected to start in November, and when complete, will generate around 92 MWth of heat for the district. You can catch up with the latest updates from this project by clicking here. China Everbright International has signed an agreement with the Rizhao Bureau of Housing and Urban-rural Development for the second phase in a project to develop a waste-to-energy (WtE) facility in Shandong Province. The company, who completed the first phase of the project back in October 2015, will install a 400 tonnes per day grate furnace and a 9 MW turbine power generator. Once complete, the facility will have a waste throughput of 1,000 tonnes per day, generating 130 million kWh of electricity each year. To access this project in full, click here. In the week ending 20th October 2017, AcuComm added/updated 40 projects to our database. These have a combined estimated value of US$4,846 million. There were 15 completely new projects and 25 updates. This brings the total number of active projects in the database to 4,895. They have an estimated value of US$346.6 million, or US$71 million on average. The UK was the leading country in the past week in terms of project value, accounting for US$1,434 million. This was equal to 29.6% of the total. The leading feedstock this week was wood, which accounted for eight projects and an estimated US$1,924 million. This is equal to 39.7 of the total this week.